As the morning turned into the afternoon the sun shined brightly and the weather was beautiful and calm. 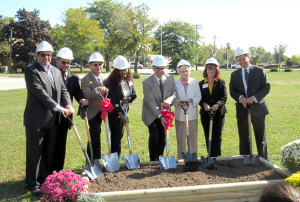 Generations at Applewood was celebrating a new chapter – the groundbreaking of its $13.5 million dollar renovation and expansion. Guests were welcomed by Generations at Applewood staff who were excited to show the display of renderings of the future look of Generations at Applewood. As guests mingled they enjoyed a variety of appetizers, wraps, and delicious desserts while listening to soothing jazz music from the band Euphony. All guests were special but there was one whose history exceeded all. She was a bright light and everyone wanted to stop and talk to Roseann Janser. Roseann Janser is a nurse who was present at the original groundbreaking. She admitted the first patient to Applewood in 1968 and spent the next 32 years delivering care to the residents. The ceremony concluded with hard hats and shovels as our special guests broke ground on construction at Generations at Applewood. The renovation and expansion will include 30 private suites, adding 30 additional beds. It will also include an internet café, ice cream parlor, expansive private dining and two story volume ceilings throughout. A state of the art rehabilitation room with advanced therapy equipment will facilitate a residents’ recovery and return home. In addition to the expansion, the existing property will see extensive renovation. Let the new chapter begin! Special thank you to: State Senator Michael E. Hastings, Representative of the 38th District (D-Olympia Fields) Al Riley, Village of Matteson President Andre B. Ashmore, Village Trustee Shelia Chalmers-Currin, Village of Matteson Trustees, Director of Economic Development Benjamin Wilson, Dennis Macon Ombudsman, Village of Matteson Officials, Police Chief of Matteson Michael Jones, Fire Chief Chris Schwalbe, Deputy Chief of Police Rob Debeikis, Pastor Matthew Troester, the Village of Matteson, Private Bank, Legat Architects, and Landmark Construction.